Thank you for your letter. I was very pleased to receive it. What a wonderful picture you paint of Washington Heights! As I was reading, I felt as if I was there. Those streets were my streets, that wet pavement smell my wet pavement smell, those crumbling buildings were my safety hazard. You have such a natural way of writing, so unforced. It was just like being a fly on the wall. I particularly liked the set of postcards from ‘Tenor’. All those pictures, all those voices. I think this was my favourite part of your letter, but I’m not sure. It was all very enjoyable. But I liked the disparate voices, talking about that same dismembered body from back in the days they knew it whole. I thought that was a clever technique that you used. I was impressed by the pieces of the man Tenor that emerged. It was good and I liked it very much. I also enjoyed the stories about women and girls, I suppose because I am both, or have been, and therefore I’m the right audience. But I liked them for specific reasons, such as their vitality! They felt very vital. Anyway, I must sign off. Thank you again for writing to me. I expect you’ve received my first letter already. I just wanted to write a quick addendum. I’m sorry about my handwriting, by the way – it’s quite late as I write this and I want to get everything down. ‘I was doing that there – it’s true. Translating everything in my head, ashamed of how much I missed, sure they’d look at me and see that I wasn’t a real Puerto Rican. You’d just slipped that in there, I saw, between Elena’s description of her memory of Aixa, the rebel, the Independentista, photocopying fliers at work, sitting on the stage at a meeting. It was Elena giving up the ghost of her identity, something that she returned to, but always submerged under Aixa’s own story of adoption and struggle. When you fractured your own description, it startled me. It stayed with me for the rest of the story, which – I can’t lie to you – felt a little too blunt and stated and packed tight with drama for me to emotionally invest in it. It was only after I went back over those lines that I started to see the fragmenting underneath your unworked, easy-clean prose. Sentence by sentence, everything looked simple, but there were chasms between every statement that I, the reader, was traversing effortlessly (because the way you wrote to me took the effort out of it), but which your characters were floundering in. No one belonged, not even in their own stories, which were falling apart around them like those dangerous buildings (cf. ‘When It Breaks’). I went back over ‘The Street’ too, because I remember that bothering me the first time round. That story jarred with me when I read it, because you came over all poetic and I wasn’t expecting it. It was as if you’d stopped writing letters to me about a place and had started writing to yourself. It felt overfamiliar but alluring in spite of (because of?) it. It wasn’t exactly my kind of writing, that dank urban prose-poetry. But the other thing was. The thing where I felt like you were you own unreliable narrator, that you were restlessly moving against the boundaries of your stories like something caged. Because you didn’t write like this again, and you say you never really went home again, and suddenly I felt like I was being tested. Anyway, I hope that clears things up a bit. ‘Vital’ was a bit of a catch-all word. I hope you’re well. In the cold light of day, I rather regret sending off that second letter. I posted it before I’d quite digested what I’d written and my arms are too stumpy to dig for envelopes in post boxes. ‘If you are from a big city – spent your childhood in one – then you know how provincial life there can be, how small your world is when you’re a child, how little access you have to all the places people celebrate in someplace like New York. ‘I wanted to remember the past. I wanted to reconstruct it. It was where I came from. And if it was gone, I was gone. These lines resonated with me for the most basic, selfish reason, and I started to wonder whether I ought to be disqualified from writing back to you because of it. I felt as if I knew the sensation exactly, but the instances leading up to it were alien. I kept looking for familiarity in places where I shouldn’t have done, because you were so gentle with the way you took me on a walk. You went straight for the soft parts of me and the rest of me followed, protesting a bit. I grew up in London, in a rough part of Walthamstow which resisted gentrification for thirty years. When I got away from it, I became a site of gentrification myself. Niceness, cleanness, safeness staked out in me. It makes me a couple of layers of fraudulent but it’s still an improvement on what might have happened, especially given how suggestible I am. You ought to hear my accent. People find it hysterical. Your letters to me, to us – your collection of stories – are described as ‘site-specific fiction’, and I did find myself wondering how exactly this was distinct from ‘writing about a certain place’. I’ve still got my qualms about the term, but I feel like I have an inkling about how it operates with you. You’re carrying Washington Heights around inside you, and you are the site of every story; the sliver of truth behind every story, every observation, is lodged in you like a splinter. This feels like a basic observation now that I come to write it down, but I want you to know I’ve observed it. I’d like to revise my use of the word ‘vital’. I’d like it to mean something similar to the vital in ‘vital organs’. These are things that grew inside you and their rawness is particular and piercing, even when the writing itself felt too easy. I suppose that to even write about a place is to clean around its edges a little, because to delineate a time, a place, a feeling, you have to knock it out and pin it down first. I hope this makes sense. I don’t want to read it back, in case it doesn’t, and after you spent an entire book making a very sure kind of sense among the mess of circumstance. Thank you again for writing. Write more soon. Linda Mannheim‘s most recent book is Above Sugar Hill (Influx Press), stories of a one time New York City landmark that became known for its high homicide rate and heroine trade. 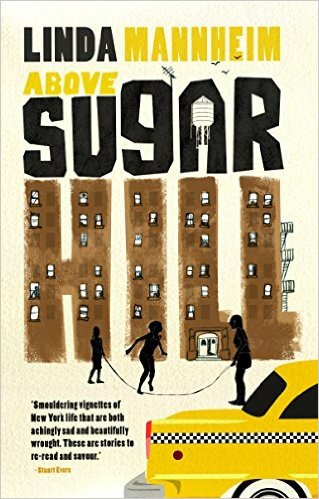 Eimear McBride wrote that: “Mannheim’s restive tales of her desiccated stretch of New York provoke and abide like a slap.” Above Sugar Hill was longlisted for the Edge Hill Short Story Prize and was a #readwomen2014 pick of the year. Born in the United States, Linda Mannheim spent the first seventeen years of her life in New York and now lives in London. Her stories have appeared in 3:AM Magazine, Ambit, and Alfred Hitchcock’s Mystery Magazine. ‘Trigger’ a story set during South Africa’s ‘border war’ is a Kindle Single. Posted in Book reviews and tagged above sugar hill, featured, linda mannheim, new york. Bookmark the permalink.